I'm getting "waiting for media" errors and clearly a bunch of media sets are out of space. But it doesn't make sense to me, since if you look at the capacity, used, and free, it doesn't add up. All the media members are on the same Synology volume, which has 2 TB free space. All the media sets have a single media member each, all go to disk. One exception is the Cloud set. I tried repairing the top media set, succeeded but made no difference. I've restarted the Retrospect server software, and the Synology (followed by restart of Retrospect server software). I don't understand what's going on here. Anyone? I should add another oddity. When editing members, I get two instances of the Retrospect share, even though there is only one (verified in Finder and by checking /Volumes). I also get different suggested "use most" for them. Before restarting (as I mentioned above), I had three instances of the Retrospect share. When accessing members through the "add member" dialog box in "Repair", I can drill down and see that I actually see the same files with the same dates in all three "shares" (that was before I restarted and still saw three of them). BTW, this is all Retrospect 16.0.0, MacOS 10.14 on the server. Say you have an empty external 500G (and I'll use round numbers for this example) hard drive you are using to store your media sets. While the external drive is empty, if you create 3 new Media Sets to be located on that drive -- all 3 media sets will have a Capacity setting of 500g -- even thought it would be impossible to fill all three sets with 500G of data simultaneously. If you back up 150G of data to each of those 3 sets, you will see that Used is 150G, but "Free" is still 350G -- for each set. But there's only 50G left on the external drive. If you made three *new* sets at this point (using the default settings) the capacity of those 3 new sets -- would each be 50G only. Even if you tried to set the % to "100" -- it wouldn't let you use more than the available free space of the disk. If you have a spare 500 GB drive, you can check if Retrospect still works that way. 25 media sets on the same volume??? Yes, all these media set members are on the same volume. 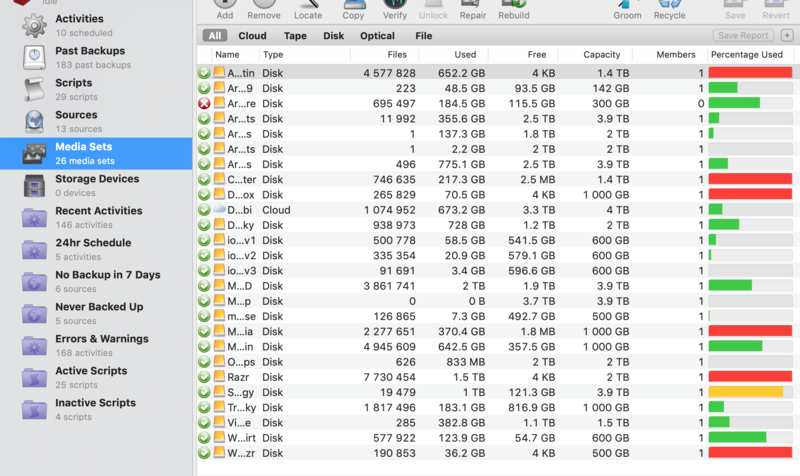 It's on a Synology where I restricted the Retrospect volume to 22 TB total. Currently, the media set members take 20 TB, and there's 2 TB free. Any reason I shouldn't have them on the same volume? In effect, Retrospect has stopped working 2 TB short of a full volume. Any reason I shouldn't have them on the same volume? You may encounter a bottleneck if you run too many backups at the same time. Isn't it difficult with so many media sets? Why not use just one, since they wind up in the same destination anyway? Also, I hope you also have an off-site backup. 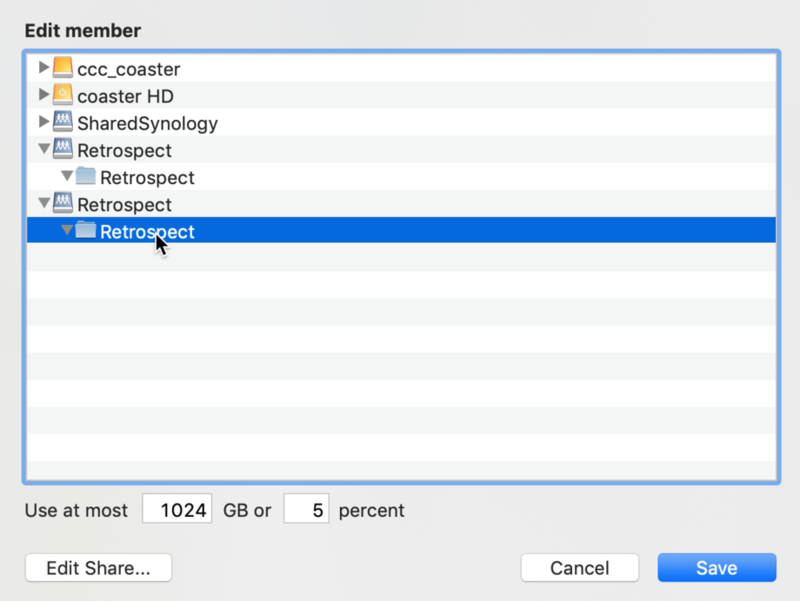 So the question is, why doesn't Retrospect use the last 2 TB? And why don't all the other media sets show as out of space, only those six? Why doesn't all of them show "Capacity 22 TB" in your (first) screen shot? It's a small hassle, but my idea was that if I retire a machine, I can also move the corresponding media set offline. The important work documents are "copy backuped" to Wasabi (that's the cloud media set). You can see that in the two screenshots I included in my second post above. 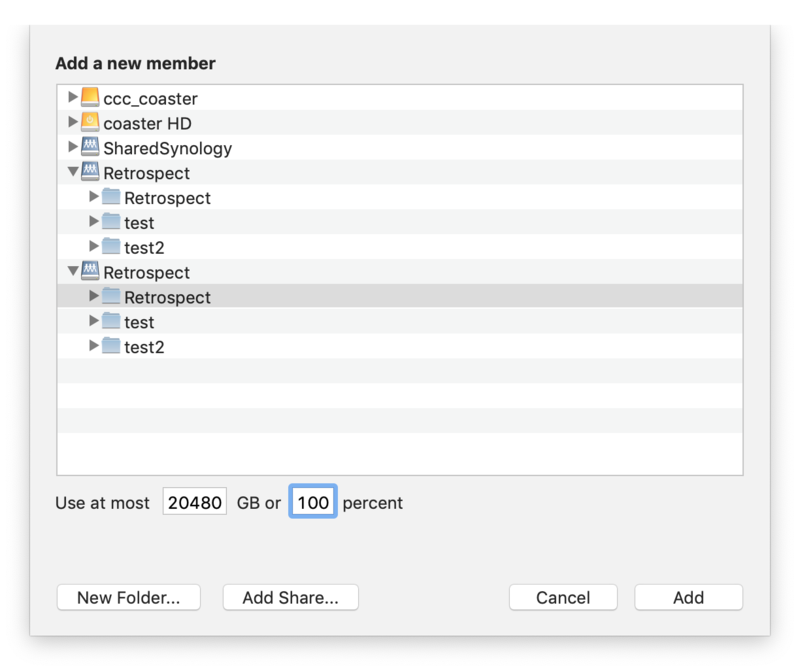 Interestingly, the first "Retrospect" share entry shows 5% of 28 TB, (1429 GB) which reflects the total space available on the Synology, while the second "Retrospect" share shows 5% of 20 TB (1024 GB) which is what Retrospect seems to limit itself to. That was, until a week ago or so, the actual limit on the Retrospect volume, which I then bumped up to 22 TB. 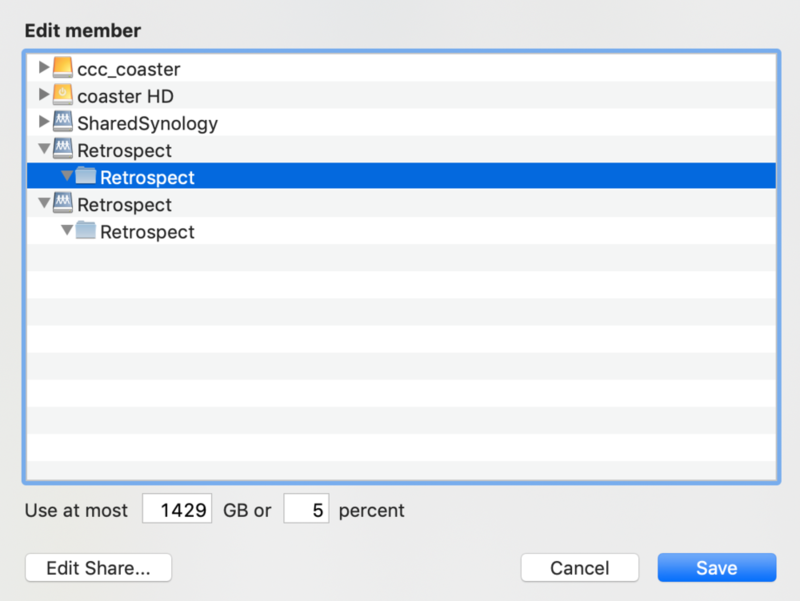 So none of the two variants of the share Retrospect displays is correct. One reflects the full drive, not the actual share, the other reflects the size of the share a week or more ago. First of all: there is only one "Retrospect" share, but Retrospect sees two, and sometimes even three, shares with the same name but different sizes. That can't be right. When I set up the media members, I did set those limits, so that's correct. I do think the basic problem must be that Retrospect is seeing the wrong total size of the volume, though. Or will Retrospect always stop 10% shy of the available space? Even if so, why two different shares and sizes? Problem solved. It was all a matter of PBKAC. I kept raising the folder quota limit on the Synology, but completely missed that there is also a quota set on the user, and yes, that one was still set to 20 TB for the Retrospect server user. Now when I go to media set member and change the "use at most", Retrospect picks up the new volume size and it works. but completely missed that there is also a quota set on the user, and yes, that one was still set to 20 TB for the Retrospect server user. Ah. That explains it. I didn't know that.